My Windermere day started at 4.30am as I wake my wife Fiona up and my 2 girls Mollie and Sharna to set off and drive up to the lakes. I only found out late on the Thursday night I was able to swim so not much time to get too nervous. 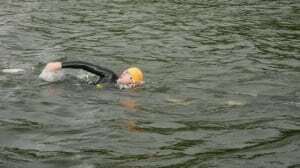 Although I still had a lot of apprehension as I had tried to do the swim 2 weeks before with Chillswim, but was pulled out of the water after 4 miles due to illness. But was great to get the chance to swim again so quickly. 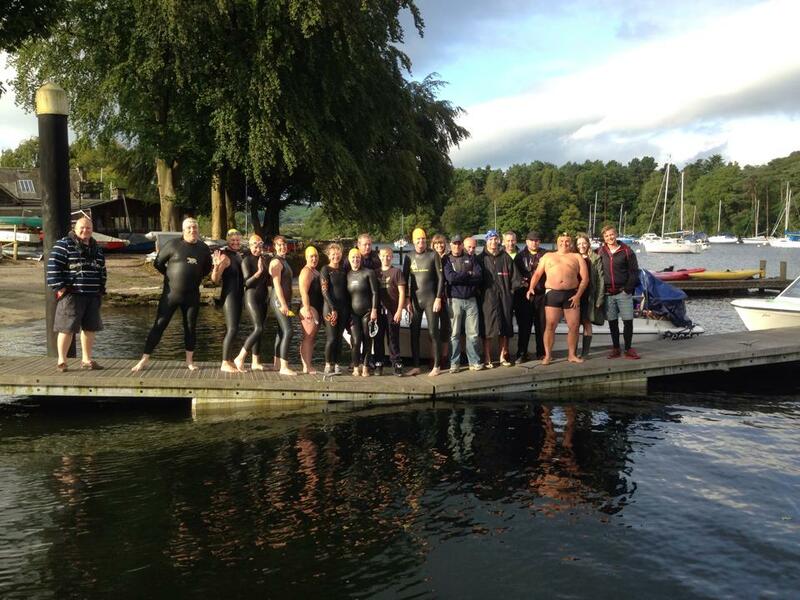 We arrived at Fell Foot to meet up with the rest of the swimmers at around 7.30. It was calming straight away to see some friendly faces and I felt much more calm. I knew I was fit enough to complete the swim as I had been training hard for 6 months and felt fuelled on porridge, flapjack and jelly babies. Was great just to chat with the other swimmers as we waited for the support boats to arrive. Got a few butterflies as the boats came into view and sailed towards us down the lake. The weather was good although there was a breeze which I was concerned would make it quite choppy during the swim. But I was ready fit it and confident I could deal with the conditions. We were split into our swim groups and introduced to our boat support crew as got the boats loaded and ready to go. I was swimming with Tristan (who strangely I had worked with some years before) and Daniel. Our crew were Heather, Kenny, Adam and Rebecca. 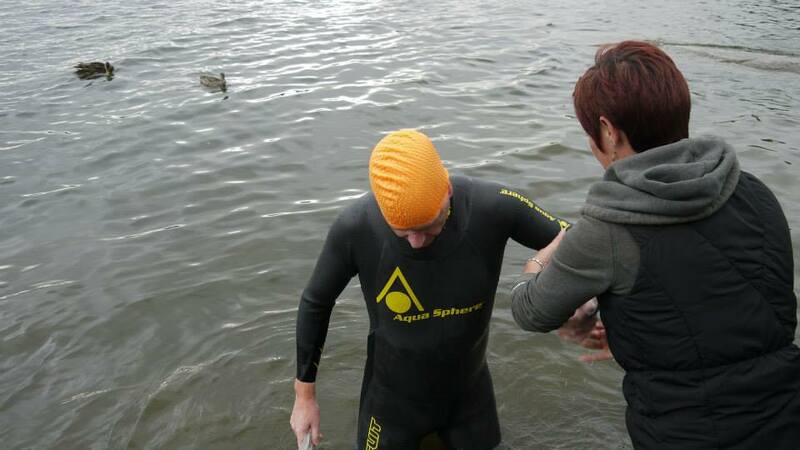 Wetsuit on, anti chaffing applied, hat and goggles on, I was ready to go. After a team photo and Alistair’s TV interview done, farewell to my loved ones, we set off on our epic swim down the length of the longest lake in England. I quickly settled into a good stroke and felt strong. 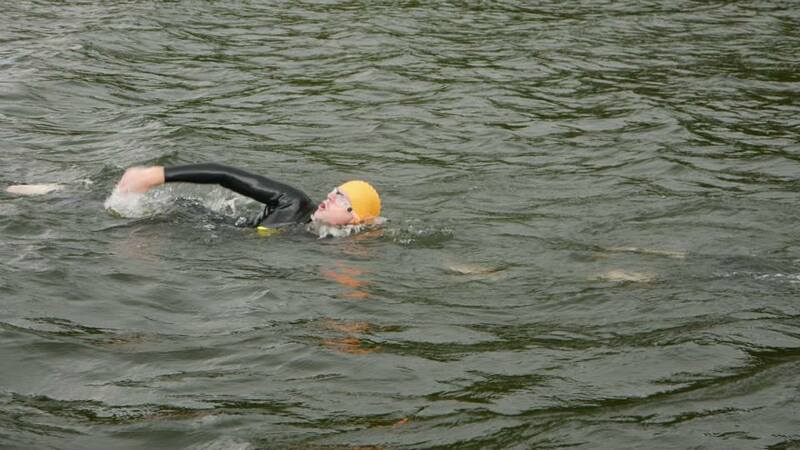 I had been visualising this swim for a long time so knew how I wanted to feel. Normally it takes me a mile to settle into a swim but on this day I felt relaxed and comfortable early on. It became apparent early that Daniel who was swimming in skins was slower than myself and Tristan, so we had to stop and wait a few times in the first mile. Not long after sadly Daniel decided to pull out. I was really disappointed for him but I knew in another way this was good as it would allow me and Tristan to get our heads down and crack on. We were already some way behind the first group. We had our first drink and feed after our first hour. I had a bag of goodies with me to give me the energy through the swim. Lucozade sports drink, glucose tablets, milky ways, flapjack and Jelly babies were my choice. Heather was mainly helping with my feeds but already the encouragement and support from the boat was proving to be a real help and motivation. The next few miles went well as we were both swimming strongly despite the water being quite choppy. The boat sailed to my right which was great as I just used it to sight which I am normally hopeless at. We went through the next couple of feeds and were making great progress. It was great to get to the calmer water of the islands as we approached halfway and started to see boat one in our sights. We had made up lots of ground on them, this was really positive. I was still feeling really good and pleased I felt so strong and had got into such a good rhythm. Our boat crew cheering us on and catering for our every need was just fantastic. We reduced our feed times to 45 mins to endure we were fuelled up for the remaining miles. This was a good decision as I was starting to need them more as we progressed. I was so glad I was swimming with Tristan as we seemed to be really pacing each other well and keeping each other going. It didn’t seem long before we only had a couple of miles to go and I was now confident I would make it. This was a great feeling. Although I was starting to feel tired I was generally in good shape and feeling good. We had caught boat one and were swimming almost alongside them. My only difficult period was in the last mile as Waterhead came into sight as I had some pain and cramp in my right bicep. Made it a painful last mile. But the support of all the people around me was fantastic. I saw my wife and kids on the waterfront as I came into the last few metres. This was a special moment as they have listened to me going on about a Windermere all year and really supported me to do it. We finished just behind the swimmers in group one. I had made it !! My wife paddled into the water to help me up, tears streaming down her face. It was an emotional moment. I had achieved something I never thought I would do. It took me 7 hours but I was surprised how physically good I felt. It was great to see the joy on the faces of the other swimmers and the crew. I was so grateful to our crews they were amazing. Every swimmer should be proud to have done it. It was a memorable day. One I will always remember and be very proud of. And to do it with the Yorkshire Outdoor Swimmers made it more special.